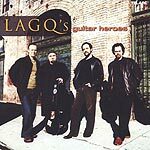 CD review: "LAGQ's Guitar Heroes"
The Los Angeles Guitar Quartet is one of those delightfully unpredictable outfits that is impossible to label, much less pigeonhole. Ostensibly a classical ensemble, the four guitarists range far afield of the classical canon  never so much as on their latest release, "LAGQ's Guitar Heroes." The baker's dozen songs here are all dedicated to particular guitarists who influenced the LAGQ members. The influences range from rock's Jimi Hendrix and Steve Howe to jazz's Pat Metheny and Django Reinhardt to the country of Norman Blake, David Bromberg and Chet Atkins. The classical side is covered by the Assad Duo and Los Romeros (one of whom, Pepe, founded LAGQ from among his students some 20 years ago). Also getting homage here are artists who were as impossible to categorize as LAGQ: Frank Zappa, Ralph Towner and John McLaughlin. One name that is a bit surprising to not find in as eclectic a roster as above is the late John Fahey, whose influences abound in the LAGQ's playing. As to the playing, as good as the technique is  and they borrow technique freely from those they are honoring  it never gets in the way of the playing. The Zappa and Hendrix tracks get pretty out there with dissonance and odd time signatures, but the quartet is just as comfortable playing the gorgeously melodic odes to Atkins and Reinhardt.